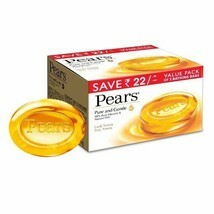 Home » JemsW's booth » Pears Transparent Original Gentle Care Soap 125 gm (Pack Of 6) Free Shipping!!!! Pears Transparent Original Gentle Care Soap 125 gm (Pack Of 6) Free Shipping!!!! $26.89 This item is selling for $26.89 on eBay. SHIPPING POLICY Free shipping WORLDWIDE HANDLING TIME: - 2 WORKING DAYS SHIPPING TIME: - 11 to 23 BUSINESS DAYS SHIPPING COMPANY: - INDIA POST NOTE: - IF BUYER HAVE ANY ISSUE REGARDING TO PRODUCT THAN CONTACT US DO NOT RASE ANY FEEDBACK BECAUSE YOUR FEEDBACK IS VALUABLE TO US ITEM WILL BE SHIPPED BY INDIAPOST (DELIVERY TIME IS APPROX 11 to 23 WORKING DAYS AFTER DISPATCH). IFYOU WOULD LIKE PARCEL ON PRIORITY SHIPPING / EXPRESS SHIPPING FASTSHIPPING WHICH INCLUDE S A STRONG TRACKING NUMBER, PLEASE CONTACT US.THERE IS ADDITIONAL CHARGES TO UPGRADE SHIPPING CHOICE. WE WILL UPDATETHE TRACKING THE PARCEL AFTER DISPATCH. INTERNATIONALBUYER PLEASES NOTE: - THE BUYER IS FULLY RESPONSIBLE FOR ANY CHARGES,IMPORT (CUSTOM) DUTIES AND TAXES IN BUYER’S COUNTRY. PAYMENT POLICY WE ACCEPT PAYMENT THROUGH PAYPAL ONLY; PAYMENT SHOULD BE MADE WITH IN TWO WORKING DAYS. RETURN POLICY RETURNSHOULD BE MADE WITHIN 30 DAYS OF THE DATE OF ITEM RECEIPT, ALL THERETURN CHARGES AND OTHER DUTIES WILL BE PAID BY BUYER ONLY IN BUYER’SCOUNTRY. YOUR SATISFACTION IS OUR AIM, WE ARE HERE AND STANDING BEGHIND OF OUR EVERY SELL. ! THANK YOU!